The PSP version runs at full 60 FPS during matches (although it reverts to around 30 frame/s for the pre-fight and post-fight cinematics). The game features game sharing, which means that only one copy of the game is needed to play over ad hoc. The game runs on version 2.6 firmware for the North American version, and the European version requires version 2.71. Other modes include Tekken Dojo, where players are able to fight ghosts of other players that can be uploaded and downloaded online. They can also download official ghost packs from arcades all over the world. In Gold Rush mode, the player fights for in-game cash. 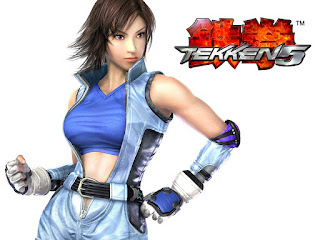 New versions of Tekken Bowl and Command Attack; bonus games from Tekken Tag Tournament and Tekken 4, are also included. Due to the PSP d-pad's lack of protrusion, Namco produced a special d-pad attachment that sits on top of the PSP's d-pad that came with early releases of the Japanese and Asian versions of the game, as well as pre-ordered copies of the US version. The European version did not include this accessory. The PSP version forgoes the original stages and music present in the arcade version (save for Final Battle 2 stage and its respective theme) and only features the new variations and music added in the Dark Resurrection update. It does contain all of the unique stages from the arcade game, however. Tekken: Dark Resurrection for the PSP was one of the most successful games of Summer 2006. In the US game charts Dark Resurrection was 5th on the list of the best selling games for July–August for 2006. As of July 26, 2009, the game has sold over 2.2 million copies.